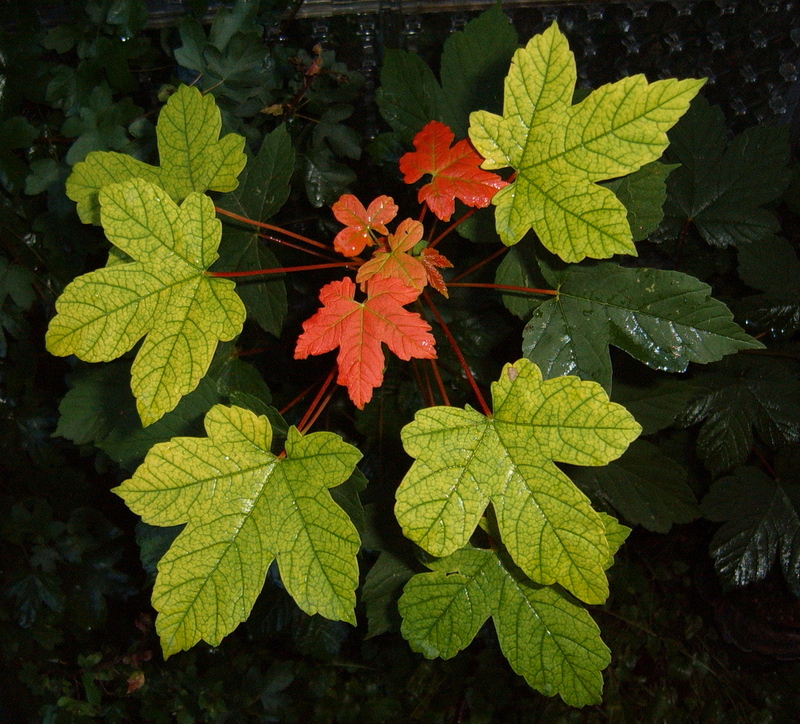 Fall is a great time to clear our systems since summer brings an accumulation of heat in our bodies, and fall’s winds can then agitate that internal heat. Think of it, what happens when you add fire to the flame? It either puts the fire out or increases it. How do you know if this applies to you? Well, part of your digestive fire is your stomach and its various gastric acids. When it’s ‘out,’ the food you swallow doesn’t get burned up completely in the stomach like it’s supposed to. Instead, undigested food bits will make their way to the small intestine causing gas, bloating, bad breath and general malaise. When your digestive fire is ‘fanned or inflamed,’ you may experience heartburn, acid reflux, and other symptoms of excess heat including quickness to anger, redness in the face and all sorts of skin rashes like eczema, psoriasis and dandruff. So instead of setting myself up for an accumulation of imbalance, especially with the holidays right around the corner, I like to do a little cleanse. This fall I was called to return to an old friend — a powerful, simple tonic that literally wipes away the body’s residue. It is called Heathee Woodrood Tonic. It is a powerful, sweet/spicy blend of herbs from Jamaica. Some of its ingredients are distilled spring water, Sarsaparilla Root, Licorice Root, Pau D’ Arco, Avocado leaves and (my two favs) God Bush and Search-mi-heart. As the legend goes, for nearly 500 years generations of Jamaicans, especially those without access to medical care, have used Woodroot Tonic as a preventative and home remedy for various ailments including epidemics and diseases; removing the buildup of toxins, mucous and waste from the entire body; impotence and virility; all digestive and gastrointestinal disorders; circulation; strengthening of the heart and blood pressure; normalizing body weight; strengthening the brain and nervous system; cleansing the liver and lymphatic and glandular systems; maintaining kidney and urinary bladder functions, etc. Woodroot tonic is part of a rich, African culture that is believed to be the secret of Africans surviving the conditions and viruses from European invasions that annihilated many indigenous peoples and caused many deaths. The recommended dose is 9 days, 2-3 ounces swigged first thing in the morning and last thing at night. There are no mandatory dietary changes. However, when cleansing the more you can steer clear of alcohol, sugar, processed foods (including dairy), heavy fried foods and unclean meats the more powerful and effective your cleanse will be. I started my woodroot cleanse 9 days ago. I did notice my taste for alcohol, sugar and meat naturally started to wane around day 2-3. Monday night was the turning point: since taking the woodroot for the past week, and as the detox process has escalated, I have felt very uncomfortable and not like myself. Tired, low energy to the max, mental dullness, feelings of overwhelm, acne, low appetite, gas, bloating, unusually noticeable body odor, etc. Around 10 p.m. the accumulation of toxins that the woodroot had been ‘escorting to the exit’ finally emerged. WOW! Without getting TOO graphic, I will tell you I experienced the kind of elimination I normally see after a week of fasting! Most noticeably a powdery brown fuzz that is an indication of candida (a bacteria that is epidemic in our western culture), a mixture of gray and amorphous ama (undigested food bits that had been hanging around the small intestine), and — most notable — an INSTANT lift — physically, emotionally and mentally. Within 15 minutes I was alert, light in body and spirit and feeling great. Within 48 hrs. all signs of imbalanced had lifted. I also noticed sparkling eyes, more color in the cheeks and lips, and a brighter energy field/aura. Another way to encourage the body’s healing process this time of year is to eat healthy soups and broths. 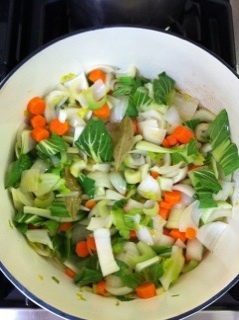 I made this soup the other night for dinner with mixed veggies and homemade chicken stock. It definitely encourages the cleansing process and builds the immune system. PLEASE NOTE: As of January 2013, HWT is back ordered. However, Robert at SonDon has a waiting list and will ship in 3-4 weeks when it is available. I can relate to all of those ‘complaints’. Infact, last night I was in bed by 8:30pm because of feeling, very tired, hot and bothered and congested. 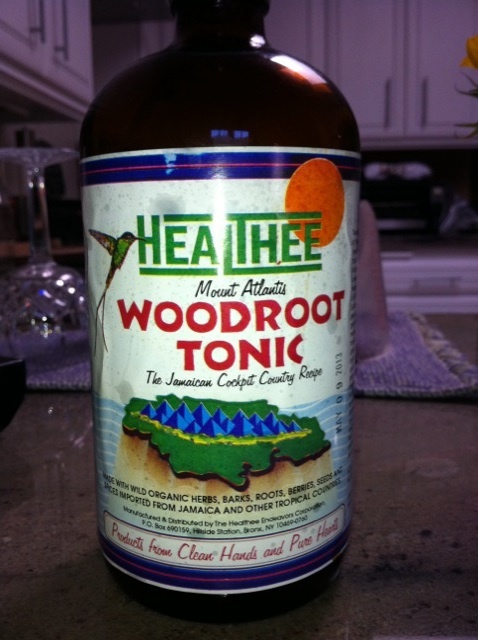 Where can I get hold of this Woodroot tonic? Thank you Barbara for your comment and compliment! I JUST hung up the phone with the folks at The Healthee Endeavors Corporation. You can order from them directly at 718 653 4140 ( http://www.macraesbluebook.com/search/company.cfm?company=628132) Don’t forget: it gets worse before it gets better. But right around day 8/9 you will get a release. Please keep us posted on your progress! Namaste. у вашего блога прикольный диз, сами верстали? Thank you. Yes, I used wordpress to type it myself. Good luck with your ancestral site! Namaste. Hey! Just bought a different brand f this at my vitamin wholesaler and found your site. Not to be to personal, but where and how did you notice the elimination of a brown fuzz? I am on day two taking of. Feeling itchy all over but feeling more energetic already. I don’t recall exactly what the brown fuzz elimination was about (the post is a few years old), but my overall energy level and radiance improved right away. It’s been a few months now, how did it end up going for you?